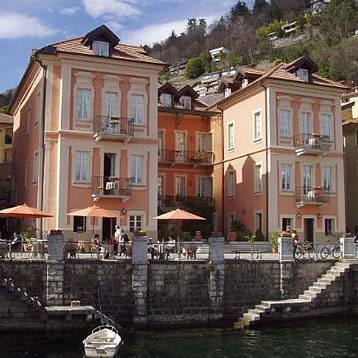 The Cannero Hotel, formed by the 2 principal ancient yellow and pink colour bodies, directly overlooks Lake Maggiore and is placed in the historical Cannero Center Coast. Inside the Hotel, the Restaurant ”I Castelli” offers a fine view of the little islands it is named after. In the bar of the Hotel, called ”Caffè Le Vele”, drinks as well as snacks are served in a pleasant atmosphere. The Hotel Cannero offers the own guests 55 rooms, divided between Suite, Superior and Standard. In the Garden among many Flowers there is a heated Swimmingpool and a Solarium. A beaten earth Tennis court and a Private Car park underline the hospitable nature of the holiday resort. In the ground floor of the renovated historical building next to the Hotel is a spacious and confortable lounge, decorated in the typical lakeside tradition. The modernly equipped meeting room is next to the lounge and contains a personal computer with Internet facilities.